Enjoy more of the fruit that started it all with an array of incredible toppings made with our legendary Royal Riviera® Pears. The cranberry pear chutney is perfect for adding flavor to sandwiches or meats. Breakfast is even better with delicious pear butter and brandied pear syrup. Use the light and flavorful pear balsamic vinaigrette to dress salads featuring spinach, crumbled blue cheese, walnuts, and, of course, slices of Royal Riviera® Pear. 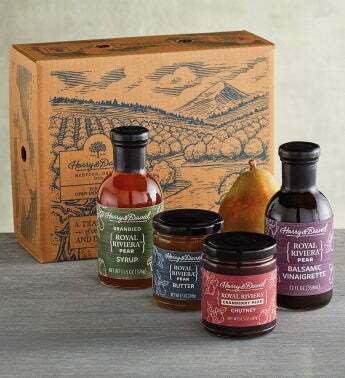 This assortment is the perfect way to enjoy the taste of our exceptionally sweet pears all day long.